I have been testing a People API get method. I noticed that it is not returning the phone number. Other data as well: addresses,biographies,braggingRights,events,imClients,interests,occupations,organizations,relations,relationshipInterests,relationshipStatuses,residences,sipAddresses,skills,taglines,userDefined. I tried all the scopes, but it doesn't help. It's really easy to test. I'd like to return the phone number. Last week it was working perfectly with only 4 scopes (April 9). How can I manage to get the phone number? Browse other questions tagged rest get google-people google-people-api or ask your own question. 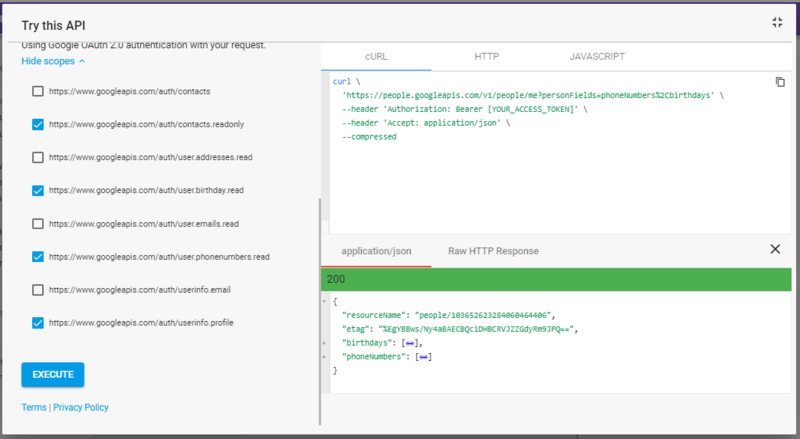 Why can't I retrieve emails addresses and phone numbers with Google People API?